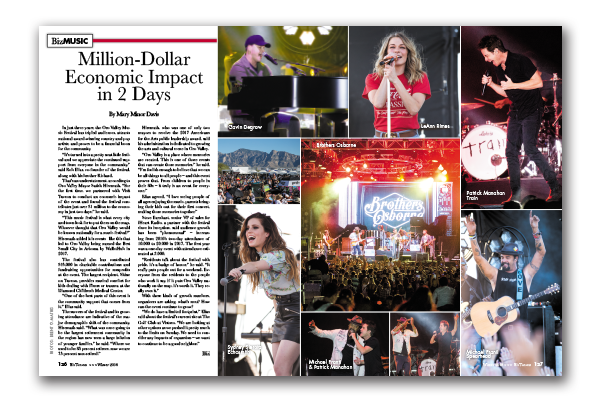 In just three years, the Oro Valley Music Festival has tripled audiences, attracts national award-winning country and pop artists, and proves to be a financial boon for the community. “It’s turned into a pretty neat little festival and we appreciate the continued support from everyone in the community,” said Rob Elias, co-founder of the festival, along with his brother Richard. That’s an understatement, according to Oro Valley Mayor Satish Hiremath. “For the first time, we partnered with Visit Tucson to conduct an economic impact of the event and found the festival contributes just over $1 million to the economy in just two days,” he said. “This music festival is what every city and town look for to put them on the map. Whoever thought that Oro Valley would be known nationally for a music festival?” Hiremath added it is events like this that led to Oro Valley being named the Best Small City in Arizona by WalletHub in 2017. The festival also has contributed $45,000 in charitable contributions and fundraising opportunities for nonprofits at the event. The largest recipient, Shine on Tucson, provides musical comfort for kids dealing with illness or trauma at the Diamond Children’s Medical Center. “One of the best parts of this event is the community support that comes from it,” Elias said. Hiremath, who was one of only two mayors to receive the 2017 Americans for the Arts public leadership award, said his administration is dedicated to growing the arts and cultural scene in Oro Valley. Steve Earnhart, senior VP of sales for iHeart Radio, a partner with the festival since its inception, said audience growth has been “phenomenal” – increasing from 2016’s two-day attendance of 10,000 to 20,000 in 2017. The first year was a one-day event with attendance estimated at 3,000. With these kinds of growth numbers, organizers are asking, what’s next? How can the event continue to grow?